Proceeds from the annual Food & Wine function at the St Francis Links Golf Estate netted R25 000 for four needy St Francis organisations. 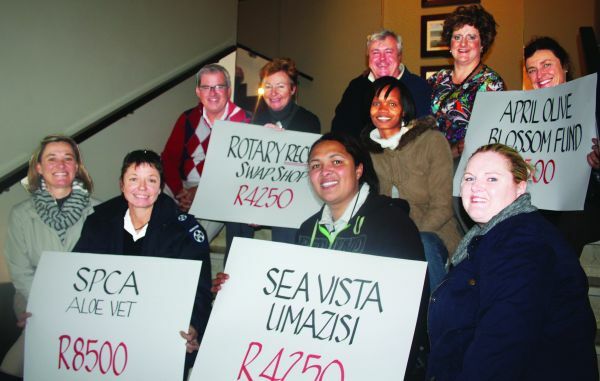 Jeff Clause and Liezl Clause this month handed over funds to delighted representatives of the charities: Olive Blossom Fund (R8500), SPCA (R8500), Rotary Recycle Swap Shop (R4250) and the Sea Vista Umazisi initiative (R4250). These organisations were thanked for the work they are doing in the St Francis community. The wine evening that raised the funds was organised by Nell-Marie le Roux of NLR Wines who annually brings wine from around 20 wine estates for the enjoyment by wine enthusiasts. Mark and Gilly Schwitter of St Francis Liquor Store assist with co-ordination and wine sales and are supported by many festive season visitors who stock up for the holidays. Through local vet, Nerine Botha, the donations to the SPCA (represented by Mariska Herselman) and the April Olive Blossom Fund (represented by Rebecca Tilders) will provide needed funds for animal health and rescue services. Lynn Aitken represented the Rotary Recycle Swap Shop is supplying a hobby for Sea Vista children. Phumza Nkwalase and Jolene Coetzer and Trudi Malan represented the new Sea Vista Umazisi project is a journalism project created for the Sea Vista communities. All donations will be spent locally in St Francis Bay. This year’s Food & Wine Festival at St Francis Links is scheduled for 19 December and wine fundis can look forward to another wonderful gathering of some of South Africa’s finest wine farms! Tickets go on sale at the beginning of December and proceeds will once again go to local charitable initiatives.